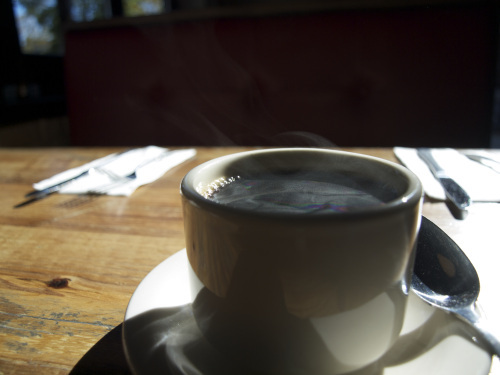 As a newcomer to the New Haven Restaurant scene, Box 63 has a long struggle ahead. Conveniently located at the corner of Park and Elm, Box 63 is across the street from Davenport and Pierson, and within walking distance of off-campus housing on Lynwood, Edgewood and Dwight. Box 63 has a potential audience, but questions remain about its ability to retain a crowd of regulars. According to their website, Box 63’s “…focus was to create a welcoming hangout that blends iconic American comfort food, healthy portions and unique cocktails, in a classic rock in roll environment.” Box 63 calls itself not merely a bar and grill, but an “American Bar and Grill,” where we are supposed to relax and put our elbows on the table. They want to create a culture of warmth, a place where a regular or a stranger can sit down and everyone knows their name. That kind of atmosphere takes time to develop, requiring a combination of good product, good service and an air of familiarity. Box 63 has quality service, no question there. Yet, for the other two criteria Box 63 tried to go too far too fast, obsessing over its design concept, instead of letting its culture grow organically. The product, namely food and drink, needs work. For dinner they offer a wide variety of “American” foods, ranging from mac and cheese to “All-American burgers.” One could make an argument for or against this definition of American food, but for me that question came second to the quality. I decided to go with a burger, the mushroom and swiss on a pretzel bun. Admittedly a good idea, the pretzel bun failed to hold together, soaking up the juices of the burger and dressings, quickly falling apart into a soggy mess. The patty itself was thick but bland, an unremarkable facsimile of a classic. In essence, the burger had no character, nothing to distinguish it from another burger I ate yesterday or will eat tomorrow. It felt too well engineered, overdesigned. Then I came in for breakfast and tried the Southern Belle, two eggs, creamy grits and scrapple. 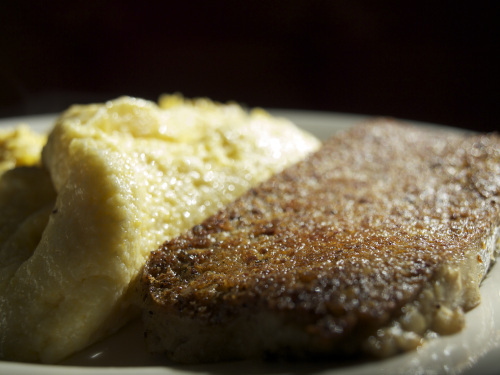 While scrapple actually originated and enjoys most of its popularity in the Mid-Atlantic states, not the south, I thought it went well with the grits. The scrapple was creamy and fried to a delicate crisp around the edges. The grits were not too bad, although a bit thick and gluey. I felt more satisfied with breakfast by far. After reflecting on my nagging feelings of discomfort, I determined that my problem with Box 63 lies in its brand; in essence, it tries too hard to be familiar. Box 63 serves burgers and finger food, but at around eleven dollars for a burger and more for the Comfort Foods, not many would be willing to just “hang out” there for extended periods beyond the bar. With décor between a diner and a restaurant, it tries to be all things American to all people (including a vibrant bar scene), and ends up engineered, manicured, groomed for success. In a restaurant that tries so hard to be real, it misses the point. Box 63 has a very specific idea of what it wants to be and what kind of relationship it wants to have with Yale, New Haven, and its patrons. In such a controlled environment, I found it hard to relax, to put my elbows on the table, to just hang out. In the end, for all its good intentions, Box 63 falls prey to the mistake of overthinking its brand. Box 63 asks its customers to feel at home, yet perhaps the restaurant should take its own advice to relax, and let its culture evolve with its customers instead of imposing prefab American-ness on them. Chicken Parmesan and the Town-Gown DivideIn "College Life"
Pancakes and Patricia'sIn "College Life"
New Haven Noodles (Part 1): Ivy Noodle- Lightning Fast Lo MeinIn "New Haven"
I see what you’re saying Zach, but the bottom-line with Box is that they will survive. They are becoming the new Toad’s (very consciously). I know this is a food blog but it doesn’t seem like this place will even care to serve food in a few months. They have captured the crowd that has kept Toad’s alive for decades and captured them hard (not to mention all of those who frequented Bulldog Burrito… not so much for the burritos but for the ‘hang out’). These Yalies aren’t worried about the soggy burgers they’re only concerned about who’s ID they can borrow to get in. That being said, they’re too expensive.